Like so many other families, our summer to-do list was loooong. 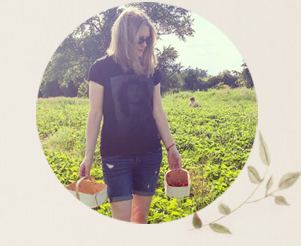 After a lengthy, cold winter, we come alive in spring and summer and we want to get ALL the stuff done! So many things around the house to spray paint, beautify and organize, organize, organize. One of the biggies still on our list at the end of August was the garage. It was a little piece of not-so-hidden chaos that was painful to look at. And embarrassing. Who wants to open the garage door to neighbours and passersby when the space is crammed to the door with junk? Whenever I see neighbours with tidy, organized garages, I think, "How do they do it?" Well, I guess all it takes is a little planning and some effort. It was time for us to take up the challenge! Our kids are 12 and 15 so I'm thinking they don't need a hundred toys in the garage at this point. Our goal was to organize our 2-car garage in such a way that we can get the cars in it this winter - well, at least one car anyway. What does that mean? It means finding other locations for the bikes, outdoor furniture and assorted sporting and camping equipment. And it means creating organized areas within the garage that harness the ample vertical space rather than taking up the floor. That's without all the mess. We had to move a lot of stuff just to have room to stand and take a photo. As you can see, the wall was abused over time. The window was untrimmed and kind of sad looking. While we did hang a few things to take advantage of vertical storage space, we really didn't think it through and plan the space well. Decide what size you want your pegboard to be. Cut it to size using a circular saw. We made ours 3 1/2 feet by 5 feet. 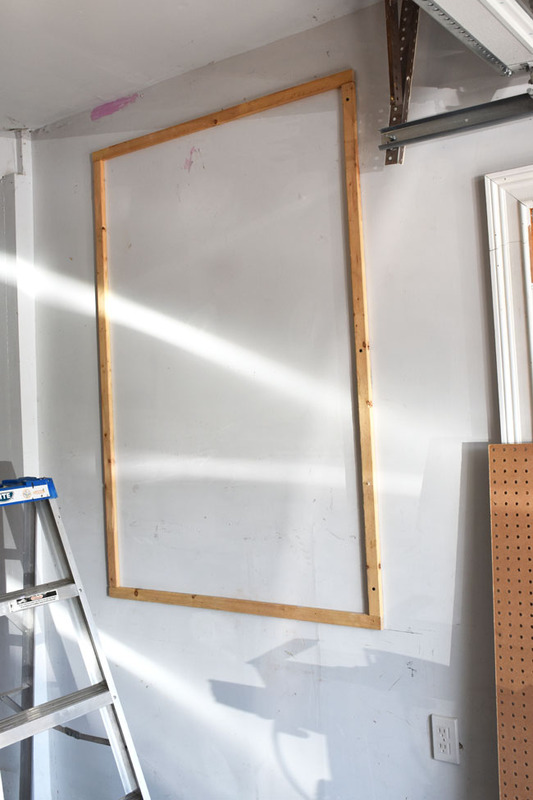 Make a framed box to mount the pegboard on, in the same dimensions as the pegboard. Cut 1x2 wood strips into 4 pieces and fasten them to the wall with nails long enough to reach studs. We used 2 1/2-inch nails and a Ryobi 18-gauge nailer. 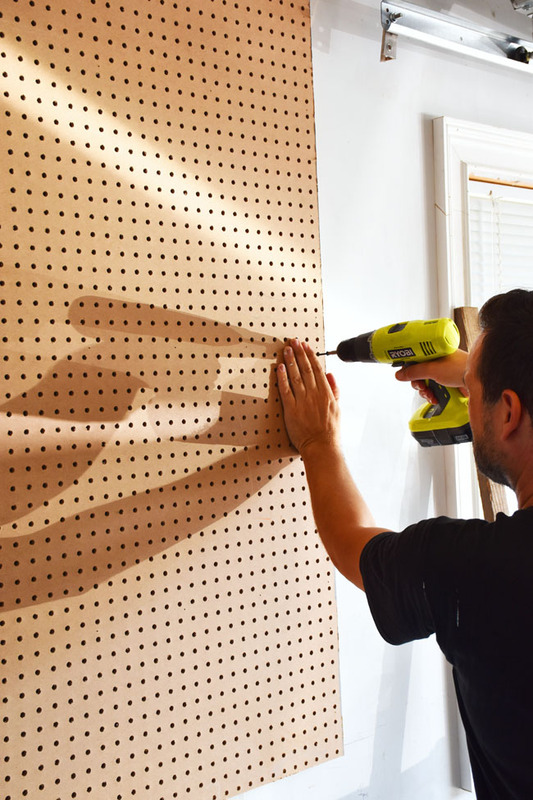 Fasten pegboard to wood frame using screws and a drill. We put in a screw every 8 to 10 inches, starting at a corner. 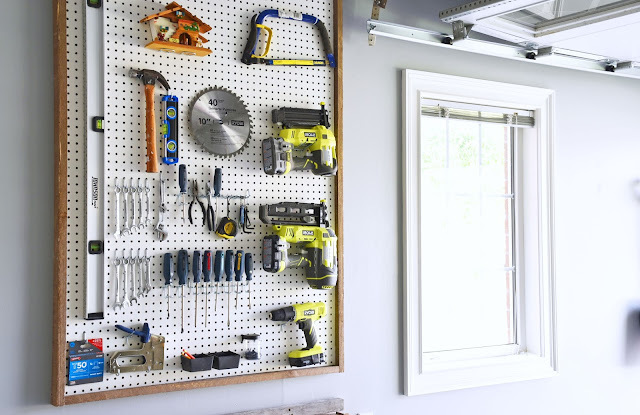 Paint the pegboard if desired. We used some leftover white interior paint. 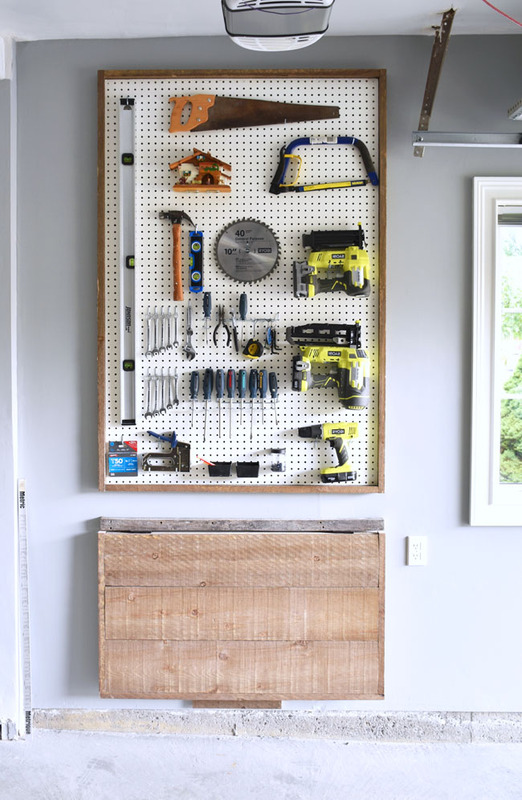 Frame the pegboard with the rustic barn board. Cut four pieces to the size of the pegboard. We chose straight cuts (ie. we butted the pieces straight against each other, for a more rustic look). Glue the corners together with carpenter glue for extra stability. Use 2-inch finishing nails to fasten the exterior frame to the mounting frame. We used a nail every 5 or 6 inches. The part of the wood that Home Depot cut for us faced the wall so that all of the visible wood had the rustic barn board finish. 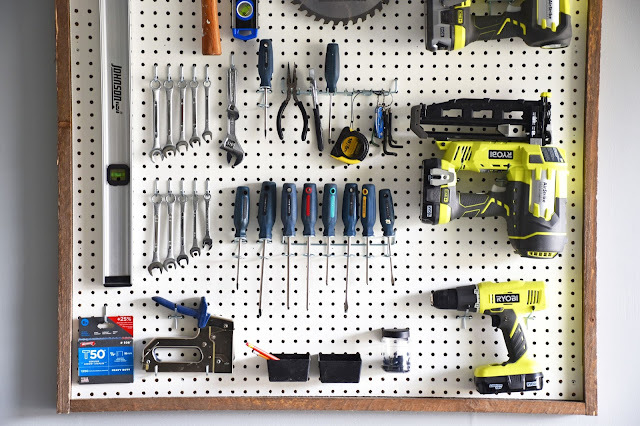 Choose the tools you want to go on the pegboard and map out where you want them to go (for ease of use and also aesthetics). Install hooks and hang tools! Enjoy your newly organized garage! We were really taken by the selection of barn board planks at Home Depot. They come in a selection of greys and browns and they have a nice rustic quality that we thought would contrast the smooth pegboard well as a frame. Pretty cool right? My daughter is now thinking of doing homework in the garage so she has her own quiet space, haha. This will be a good spot to pull up a stool and do tasks such as gluing and painting. We painted the garage walls with Behr's Premium Plus Ultra interior paint in Lunar Surface, a soothing medium grey that adds a pretty, calming feel to the space. My husband framed the small window as well, to make the garage a little more attractive. I mean, I know it's a garage, but it's also nice to feel more at home in your space, whatever its function is. We have more work to do in the garage - we want to clean it out entirely so we can wash the floor. There are a couple of boxes of papers that my husband has had for 20 years that I'm hoping might soon go bye-bye. We also have plans to create a recycling bin organizer/holder. Right now the bins are loose on the floor and I find it irritating. But right now we're really pleased that we've managed to create this organized, efficient pegboard wall storage for our garage. 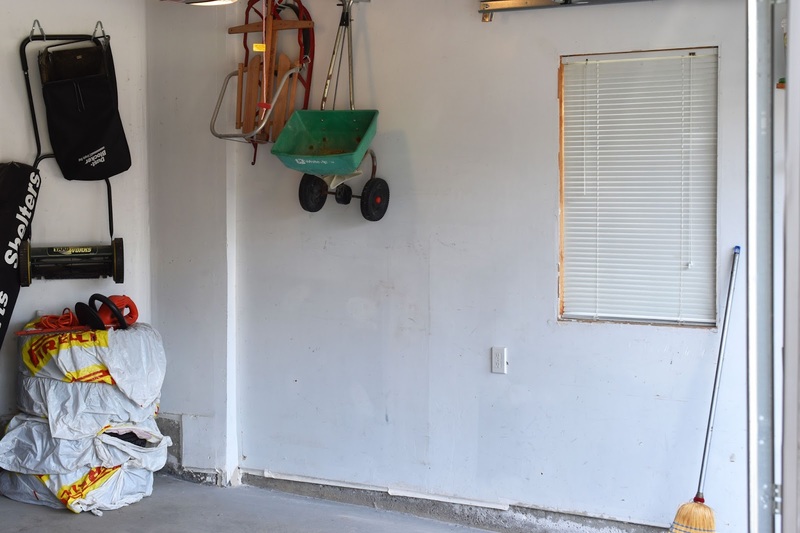 It's a big step towards the better-functioning garage space that we want. And there's no more need to search the house for hammer, level or measuring tape! What about you? 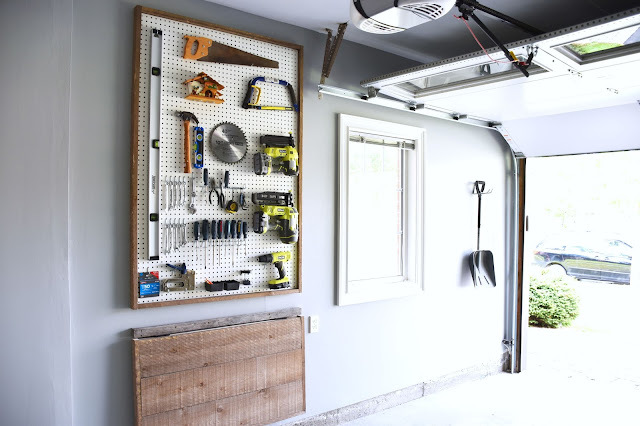 If you have a garage, do you keep it organized? If so, how? Your advice is most welcome! Wow! It looks cleaner and lighter. Really like the paint colour you chose for this project. 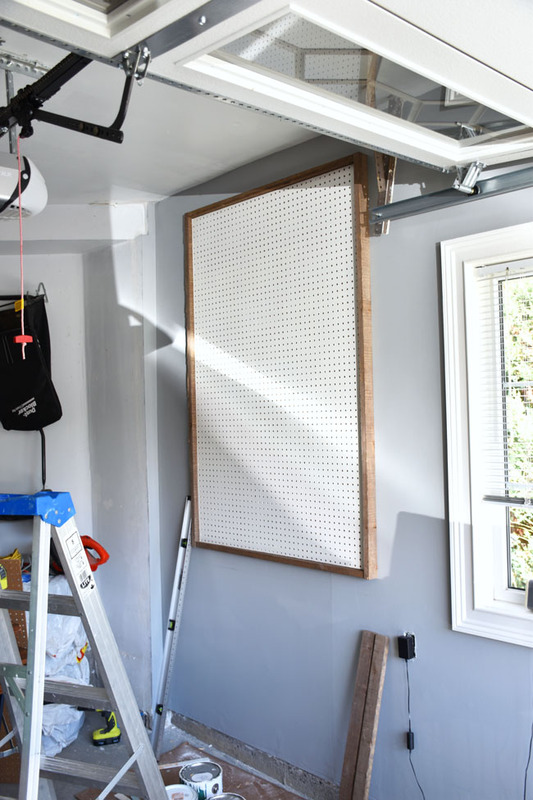 A pegboard with a work bench makes a pretty cool place to hang out. I totally get your daughter's idea! In regards of organizing ideas. Have you thought about making the most of the ceiling and walls yet? I am talking about vertical storage. The garage is part of the house, another big room or even an extension in some cases. 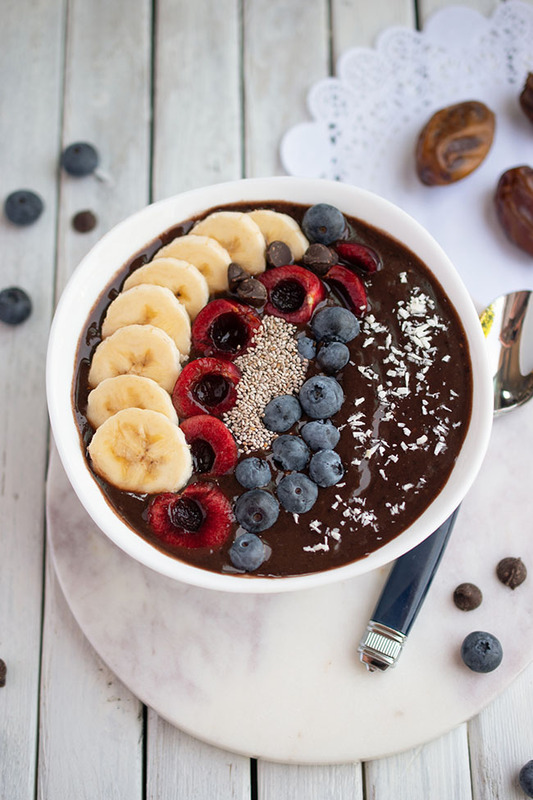 It should look good as well. We had a garage and could never keep it organized so we turned it into a family room...which surprisingly is kept quite tidy. My favorite aspect of your fixing up here is the peg board...it is so very pleasing to the eye. My husband has put up many pegboards over the years, but none were this attractive. I am sending him this post. Thank you. wow! what a great project! 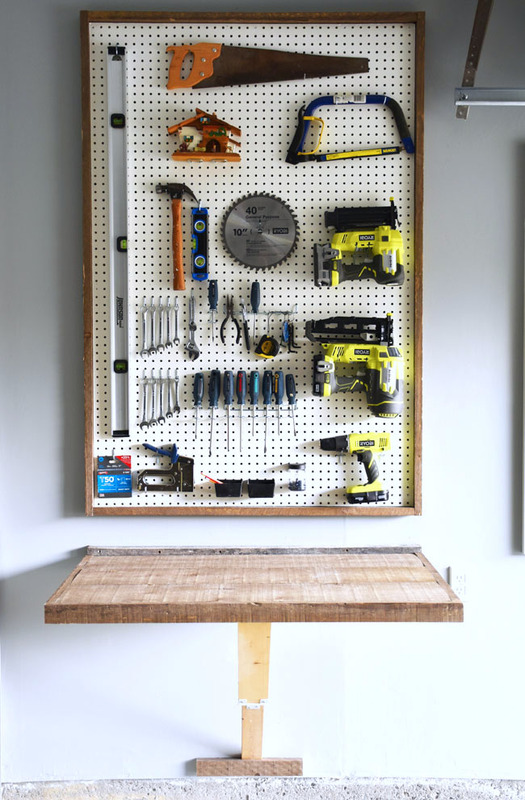 I love the pegboard, and the way the work bench folds out of the way. our garage is a disaster. ugh. we could really use something like this; it would make it so much easier to find things! Wow we So need this.Seems like a fairly simple project,too.Thanks for sharing! Awesome idea. My tools ares stuffed in various drawers throughout my apartment. 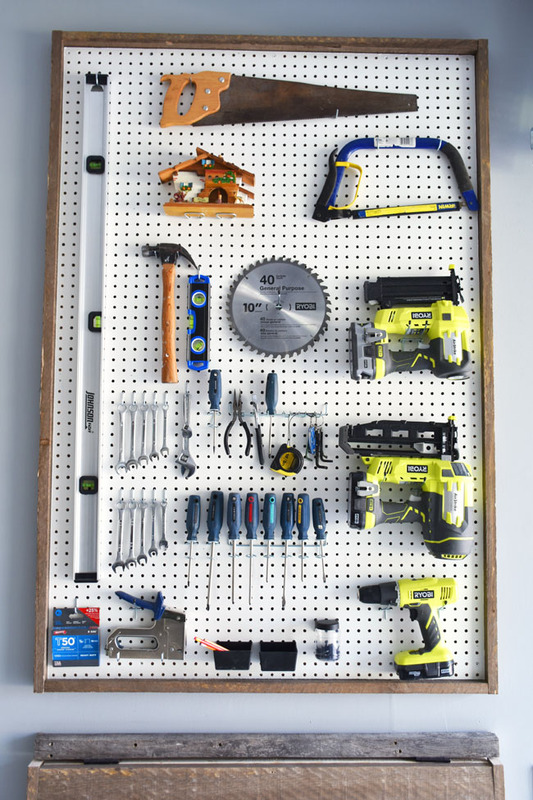 I haven't seen my hammer in a year or so :0 So I could use this pegboard idea. I especially like that little shelf! We had a great tool organizer in our past garage and have been meaning to get something done in our current garage. This may be my impetus to get it going. the pegboard is impressive! I would like to have one for kitchen tools. Peg boards are for sure the way to go. I love how it keeps everything so neat and tidy. We had a peg board in our last house but this one does not have a garage. I would do it again in a heartbeat. I love your. I'm not a super handy person, so I don't have a lot of tools for renovating / fixing things, but I could definitely see myself making one of these to store other things in my house - kitchen items, home office stuff, etc. I would like to make a smaller version to put in my laundry room because I have my own tools, separate from hubbies. What a difference a bit of organization makes. My hubby just hung a peg board for me in my craft room and I'm enjoying knowing where to find things for a change.